Records would seem to suggest that a very small chapel existed in Bridgtown before the village was developed in 1861. This was a red-brick building with round-headed windows and blue-brick dressings which was built in the 1850s. It stood behind the chapel shown in the photographs. Then in 1863 a slightly larger chapel was built to coincide with the growth of the village. This was a stone-dressed building which later came to be used as a Sunday School. Residents used to talk about “The Big Chapel” or “The Top Chapel” and this is the one shown in the photograph. 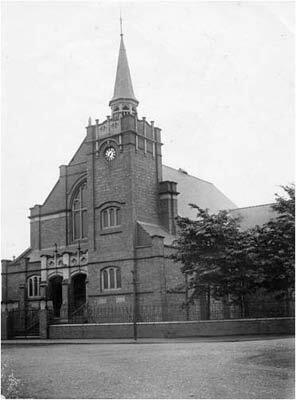 It was a Methodist New Connexion chapel built of red brick and erected in 1901 at the top of Park Street. After the first Methodist Union in 1907 it became a United Methodist chapel and, after the second Methodist Union in 1932 became Park Street Methodist Church. Before and after World War Two the church was a thriving organisation. In those days the Sunday School had over 100 children on the register. In post-war years church members put on many memorable shows and plays which were well supported by the local community. Many of these were organised by Dora Richards and Oliver Wood. The church also played host to a popular Boys’ Brigade group and ran an extremely successful Youth Club. Unfortunately, in the 1950s and 1960s the church’s membership began to diminish. The last service was held in 1965 and church members mainly moved to the new St. Stephen’s Church in Bideford Way, Cannock. The Church was then acquired by the Humphries family who started a company called “Midland Commercial Pressing”. It was then bought by Mr Jan Scott in 1987 who continued trading until ill health forced him to sell the company. The company survived for a short while then the building was acquired and demolished in 1994. The site now holds an apartment block. Many thanks go to Mr Jan Scott for writing to us and updating our records of the latter days of the building.